Objective measurement technology of woven fabrics; Fabric structural properties; The tensile properties of woven fabrics; The bending properties of woven fabrics; The shear properties of woven fabrics; Fabric complex deformation analysis and simulation; Properties of fabrics with seams; Modelling drape deformation of woven fabrics and garments - theory; Modelling drape deformation of woven fabrics and garments - computation and simulation. Fabric mechanics are fundamental to the way textiles are designed, tested and manufactured and underpin the way woven fabrics are used in the modern world. With fully comprehensive coverage of all aspects of fabric anisotropy, stress-strain relationships and fabric drape modelling and testing, Structure and mechanics of woven fabrics, discusses and exemplifies all major aspects of fabric mechanics and their relevance to every stage of the contemporary textile industry. 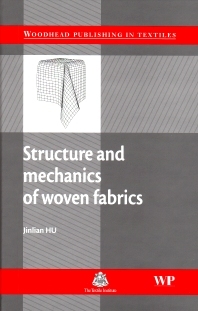 After a general introduction illustrating the role and study of woven fabric mechanics, the first group of chapters examines the structural, tensile, bending and shear properties of woven fabrics. Sections cover the general behaviour of these properties, how they are modelled and their anisotropy. Drape deformation modelling is covered extensively, one chapter detailing theory and a second, computation and simulation. The properties of fabrics with seams and fabric complex deformation analysis and simulation are also detailed. Structure and mechanics of woven fabrics is an essential reference for all textile academics, students, researchers, technicians, engineers and technologists, covering all areas of textile material applications, from composites and geotextiles, to medical textiles and biotextiles. Jinlian Hu is a Professor at the Institute of Textiles and Clothing, Hong Kong Polytechnic University. A Fellow of the Textile Institute, she was also the recipient of the 2001 Award for Distinguished Achievement from the US Fiber Society. Professor Hu has published over 300 articles and several books on textile materials. She is currently the Editor-in-Chief of the Research Journal of Textiles and Apparel.